Hi, there! So glad you are check in on what’s happening at Flawed yet Functional today! I believe in eating whole, real food, but that can be difficult for some of us. How can you maximize your health without spending all day in the kitchen? There are many answers to that question, but the one I want to focus on today is maximizing leftovers. 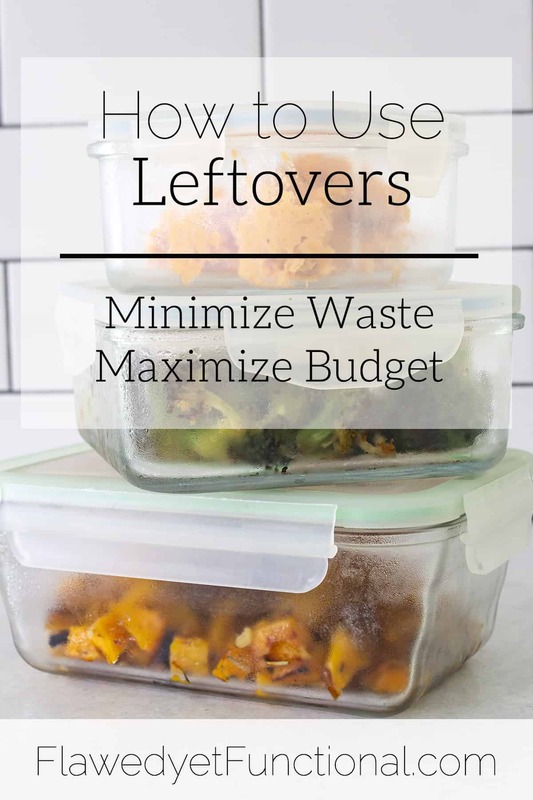 Learning how to plan for and use leftovers optimally not only saves you time in the kitchen to help you stay on track eating healthy food but it also maximizes your grocery budget. First up, feel free to plan on leftovers. When I’m creating my menu plan and I know I’ll have leftovers from a certain recipe, I mark a “L” at the next meal that I plan to use leftovers. This way I can quickly glance at my plan and know if a recipe will last more than 1 meal. So how do I know how much leftover I’ll have from a meal? Below is a list of general guidelines for my family. It doesn’t always work. Sometimes my family is really hungry resulting in fewer or no leftovers. 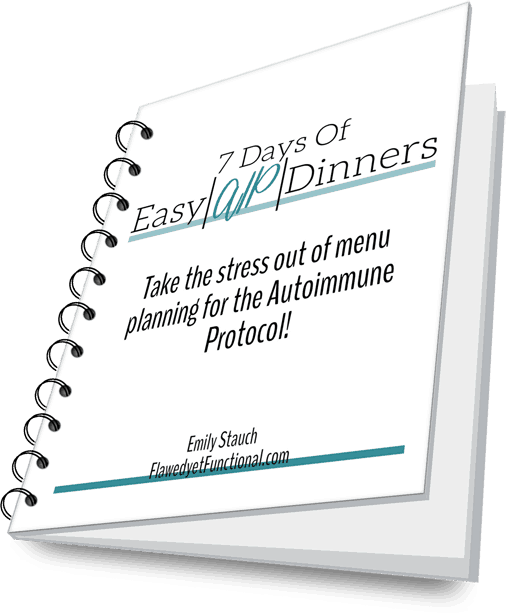 However, since I make a menu plan each week, there is always another meal or extra food in the freezer so a hungry family doesn’t break us. Serving size – I look at the number of servings the recipe claims it makes then use my judgment on top of that. There does not appear to be a standard for serving size for prepared meals, so serving size is not always reliable. For my family of four, a recipe that serves only 4 will be at most one meal for us, maybe not even one meal. If I’m making a recipe that serves 4, I always double it, maybe triple if it’s one my boys really like. Entree type – Sometimes, I estimate my leftovers by the type of dish I am making. Soup – I estimate 1 cup per person per meal. One pan meal (casserole type) – If it’s in a 9×13, it will feed my family two dinners. Burgers/Fillets – For hambgurgers or fish, I estimate 1 good sized patty/fillet per person per meal. However, we do eat larger burgers in this household, each hamburger patty is about 5 ounces. Roast – I don’t make roasts often enough to have a good rule to go by, but I know if I’m making about a 5 pound roast that it will feed us 3+ meals. Roasts tend to last so long, I need to remake them into another dish because we get tired of eating them (see below)! There are tricks to using leftovers. Leftover meat doesn’t always taste as good as fresh, and sometimes the original dish was just not tasty to begin with. So what should you do with all those leftovers?? This is the easy one, just eat the same meal you prepared the night before. Pile your plate with the entree and side dishes exactly as before, toss it in the microwave to warm it a bit, and enjoy! The next best thing is to turn the leftovers into a new dish. This takes practice, but once you get in the habit of thinking of new ways to use your leftovers, you will find yourself never running out of ideas. Here are some ideas to get your brain juice flowing…once you start looking for different ideas this will get much easier and come naturally. Too much broth from a soup – Add some other meat and leftover veggies to make a whole new soup! For example, say you have leftover pork roast and roasted root vegetables, shred the meat and chop the veggies small then add to any broth based soup. Warm it up then taste for salt and pepper. Think outside the box as far as type of meat (chicken and pork are fairly interchangeable). For example, have a lot of taco fixings left over but no meat? Use leftover beef, chicken, pork, chorizo, venison, really any meat, and season it as you would usual taco meat. Heap on the toppings and enjoy! If you can’t think of a way to re-create and you just can’t bear to eat that fill-in-the-blank-meal anymore. Freeze it! Most food will be just fine in the freezer. Put it in a freezer-safe container or freezer bag, mark what’s inside (you will forget!) then save it for another day. Warming up leftovers is not always simple if you are going for optimal flavor. If you don’t care what it tastes like, then throw it on a plate and nuke it! If you’d like your leftovers to be more tasty, try these tips. Meat is best reheated on the stove-top or in the oven, but if you must use the microwave, go easy. Slightly warm will have better texture and flavor than a piping hot dish. In my microwave, I don’t reheat meat for more than 30 seconds. Besides just meat, there are dishes that reheat beautifully in the microwave, soups and casseroles namely. If it’s covered in sauce, broth, or is a wet dish, it will reheat well in the microwave. Simply put the food in a microwave-safe container, cover to avoid splatters, then microwave for 20-30 seconds stirring in between to ensure even heating. Casseroles or large amounts of any dish do well being reheated in the oven. I love using the oven for meals like this because it is more hands-free. If I’m using the microwave, I’m either reheating one plate at a time or constantly stirring the dish so it heats evenly. In the oven, turn it on and pop the pan in. Check on it in 20 minutes. So easy! The other type of dishes I like to use the oven for are ones that have a crisp texture. The microwave will only return a limp texture so for dishes like Roasted Sweet Potatoes & Kale Chips or Crispy Chicken Thighs, I like to use either the oven or the broiler. Those are my three tips for maximizing leftovers : plan, use, and heat them properly and you’ll be good to go. Your grocery budget will stretch farther, and you’ll be able to take nights off in the kitchen while still providing whole, healthy food for your family. What tips do you have for using leftovers? Do you eat leftovers? Or do they give you the heebie-jeebies? Previous Post: « Happy Labor Day!